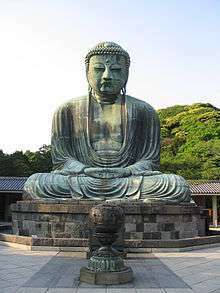 Buddhism has been practiced in Japan since its official introduction in 552 AD according to the Nihon Shoki from Baekje, Korea by Buddhist monks. Though some Chinese sources place the first spreading of the religion earlier during the Kofun period (250 to 538). Buddhism has had a major influence on the development of Japanese society and remains an influential aspect of the culture to this day. In modern times, Japan's most popular schools of Buddhism are Pure Land Buddhism, Nichiren Buddhism, Shingon Buddhism and Zen. As of 2008 approximately 34% of the Japanese identify as "Buddhists" and the number has been growing since the 1980s. The arrival of Buddhism in Japan is ultimately a consequence of the first contacts between China and Central Asia, where Buddhism had spread from the Indian subcontinent. These contacts occurred with the opening of the Silk Road in the 2nd century BC, following the travels of Zhang Qian between 138 and 126 BCE. These contacts culminated with the official introduction of Buddhism in China in 67 CE. Historians generally agree that by the middle of the 1st century, the religion had penetrated to areas north of the Huai River in China. Fusang is located to the east of China, 20,000 li (1,500 kilometers) east of the state of Da Han [China,大漢] (itself east of the state of Wa in modern Kansai region, Japan). (...) In former times, the people of Fusang knew nothing of the Buddhist religion, but in the second year of Da Ming of the Song Dynasty (467), five monks from Kipin [Kabul region of Gandhara] travelled by ship to Fusang. They propagated Buddhist doctrine, circulated scriptures and drawings, and advised the people to relinquish worldly attachments. As a result the customs of Fusang changed. Although there are records of Buddhist monks from China coming to Japan before the Asuka Period, the "official" introduction of Buddhism to Japan is dated to 552 in Nihon Shoki when the King Seong Myong (聖明王) of Baekje (in modern west Korea) sent a mission to the Emperor Kinmei that included Buddhist monks or nuns together with an image of Buddha and a number of sutras to introduce Buddhism. The powerful Soga clan played a key role in the early spread of Buddhism in the country. Initial uptake of the new faith was slow, and Buddhism only started to spread some years later when Empress Suiko openly encouraged the acceptance of Buddhism among all Japanese people. 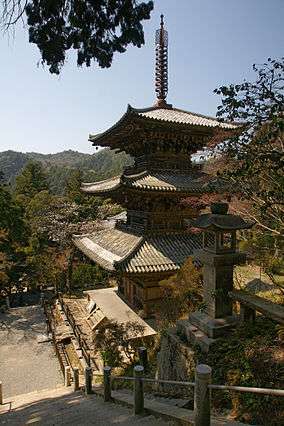 The Late Nara period saw the introduction of Tangmi (Esoteric Buddhism, mikkyō) to Japan from China by Kūkai and Saichō, who founded Shingon Buddhism and the Tendai school, respectively. Additionally, it was during the Kamakura period that the influential monk Nichiren began teaching devotion to the Lotus Sutra. Eventually, his disciples formed their own school of Nichiren Buddhism, which includes various sects that have their own interpretations of Nichiren's teachings. New doctrines and methods were not to be introduced, nor were new temples and schools. The only exception was the Ōbaku lineage, which was introduced in the 17th century during the Edo period by Ingen, a Chinese monk. Ingen had been a member of the Linji school, the Chinese equivalent of Rinzai, which had developed separately from the Japanese branch for hundreds of years. Thus, when Ingen journeyed to Japan following the fall of the Ming dynasty to the Manchu people, his teachings were seen as a separate school. The Ōbaku school was named after Mount Huangbo (Chinese: 黄檗山; pinyin: Huángbò shān; Japanese pronunciation: Ōbaku shan), which had been Ingen's home in China. Also notable during the period was the publication of an exceptionally high quality reprint of the Ming-era Tripiṭaka by Tetsugen Doko, a renowned master of the Ōbaku school. Post World War II, there was a high demand for Buddhist priests who glorified fallen soldiers, and gave funerals and posthumous names, causing a strong revival. 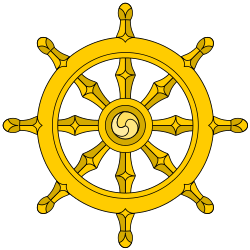 However, due to secularization and materialism, Buddhism and religion in general, continued to decline. In the post-Meiji, pre-WWII period, there were officially 13 schools and 56 branches (ja:十三宗五十六派) of traditional Buddhism (i.e., those not established in modern times). 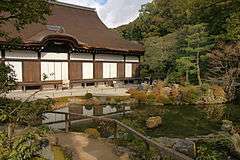 The official schools included three from the Nara period, two from the Heian period (Tendai and Shingon), four Pure Land schools, three Zen schools (Rinzai, Sōtō and Obaku), and Nichiren. During the war, this was halved to 28 branches, but the law enforcing this was repealed following the end of the war, allowing former branches to return. Further, since then, many groups have split off from existing branches. The Tattvasiddhi school (成實宗, Jōjitsu-shū) (formerly known as the *Sātyasiddhi) is considered to be an offshoot of the Bahuśrutīya, an Indian Sautrāntika school of Nikaya Buddhism; however, the Tattvasiddhi's position was also close to that of the Sthavira nikāya. They were distinguished by a rejection of abhidharma as not being the words of the Buddha. It was introduced to Japan as Jōjitsu in 625 by the monk Ekwan of Goryeo. In Japan, it was classified as one of the three approaches of East Asian Mādhyamaka instead of a separate lineage. East Asian Mādhyamaka (三論宗, Sanron-shū) was one of the six Nara sects (南都六宗, Nanto Rokushū). This school was transmitted to Japan in the 7th century. Literally: Three-Discourse School; a Madhyamaka school which developed in China based on two discourses by Nagarjuna and one by Aryadeva. Madhyamaka is one of the two most important Mahayana philosophies, and reemphasizes the original Buddhist teachings that phenomena are neither truly existent or absolutely non-existent, but are characterized by impermanence and insubstantiality. 736: Bodhisena introduces the Kegon (Avatamsaka) school to Japan. Also known by its Chinese pronunciation Huayan (華厳), the Kegon school was founded by Dushun (杜順, Jp. Dojun), China, c. 600, and introduced to Japan by the Indian monk Bodhisena in 736. The Avatamsaka Sutra (Kegon-kyō 華厳経) is the central text for the Kegon school. The Shin'yaku Kegonkyō Ongi Shiki is an early Japanese annotation of this sūtra. 753: Jianzhen (Chinese: 鑑真) introduces the Risshū (Ritsu or vinaya school) to Japan. A Sarvastivada school, Kusha-shū focussed on abhidharma analysis based on the "Commentary on the Abhidharmakośabhaṣya (倶舎論)" by the fourth-century Gandharan philosopher Vasubandhu. The school takes its name from that authoritative text. 807: Saichō introduces the Tendai (Tiantai) school to Japan. Known as Tiantai (天台) in China, the Tendai school was founded by Zhiyi (智顗, Jp Chigi) in China, c. 550. In 804 Saichō (最澄) traveled to China to study at the Tiantai teachings, at Mount Tiantai. However, before his return he also studied, and was initiated into, the practice of the Vajrayana, with emphasis on the Mahavairocana Sutra. The primary text of Tiantai is Lotus Sutra (Hokke-kyō 法華経), but when Saichō established his school in Japan he incorporated the study and practice of Vajrayana as well. 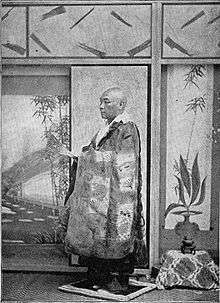 1191: Eisai introduces the Rinzai school to Japan. 1227: Dogen introduces the Sōtō (Caodong) school to Japan. 1654: Ingen introduces the Obaku school (Huangbo) school to Japan. 1253: Nichiren (日蓮: "Sun-Lotus") expounds his teachings. Nichiren Buddhism split into several denominations after the death of Nichiren in 1282. The Nichiren Fuju-fuse-ha sub-sect of Nichiren Buddhism was abolished in 1669 and legalised again in 1876. Today's Nichiren Buddhism is represented by traditional-oriented schools such as Honmon Butsuryū-shū, Nichiren Shū and Nichiren Shōshū and more recent movements like the Soka Gakkai, Risshō Kōsei Kai, and Reiyūkai. See Nichiren Buddhism for a more complete list. Various other Greco-Buddhist artistic influences can be found in the Japanese Buddhist pantheon, the most striking being that of the Japanese wind god Fujin. In consistency with Greek iconography for the wind god Boreas, the Japanese wind god holds above his head with his two hands a draping or "wind bag" in the same general attitude. [lower-alpha 3] The abundance of hair has been kept in the Japanese rendering, as well as exaggerated facial features. Soga no Umako built Hōkō-ji, the first temple in Japan, between 588 to 596. 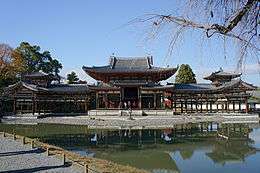 It was later renamed as Asuka-dera for Asuka, the name of the capital where it was located. 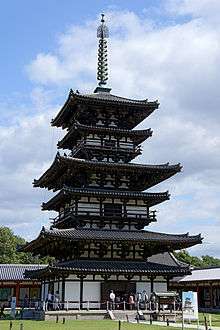 Unlike early Shinto shrines, early Buddhist temples were highly ornamental and strictly symmetrical. The early Heian period (9th–10th century) saw an evolution of style based on the esoteric sects Tendai and Shingon. 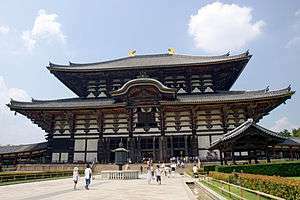 The Daibutsu style and the Zen style emerged in the late 12th or early 13th century. Though its date and practices vary region to region, the Buddhist Obon festival is celebrated primarily in Japan and in communities with large Japanese diaspora communities. It is believed that the spirits of the dead return to earth for three days and visit the family shrines or graves. It is customary to clean the graves and to hold family reunions. 1 2 Dykstra, Yoshiko Kurata; De Bary, William Theodore (2001). Sources of Japanese tradition. New York: Columbia University Press. p. 100. ISBN 0-231-12138-5. 1 2 Snelling & 187, p. 178. ↑ Ministry of Internal Affairs and Communications (2013). Japan Statistical Yearbook 2014 (in Japanese). Tōkyō: Nihon Tōkei Kyōkai. ↑ When Disobedience is Filial, Dr.J. Stone p.262 Princeton University "Archived copy". Archived from the original on 2015-01-04. Retrieved 2015-01-04. 1 2 Lopez 2013, p. 547. 1 2 Lopez 2013, p. 574.